Altus Exchange is a place where your entire financial world comes together, on-line and in real time. For many investors paperwork and multiple platform accounts can be overwhelming. It often makes it difficult to see the bigger picture. How do you know where you are going when you can’t see where you are? 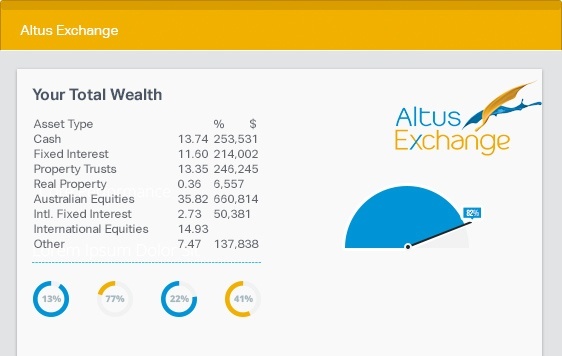 Altus Exchange gives you a rich and accurate picture of your entire financial world—online in one place. "Altus Exchange has provided a better 'working' understanding of what's going on in our Family Superannuation Fund because it gives me 24/7 access on the status of our portfolio. It has become a significant financial teaching and goal setting tool that my wife and I can work comfortably with. It allows us to have effective and efficient discussions on our finances with Rod Dickinson and his team." Sounds great right? If you'd like to know more complete the form below.